What is Astronomy in Action? Astronomy in Action believes that everyone should experience the wonders of the universe with friends and loved ones. With most people in Ontario living in cities, bright lights make it difficult to see anything more than the Moon and a few bright stars and planets. With a portable planetarium, Astronomy in Action brings the universe to you! 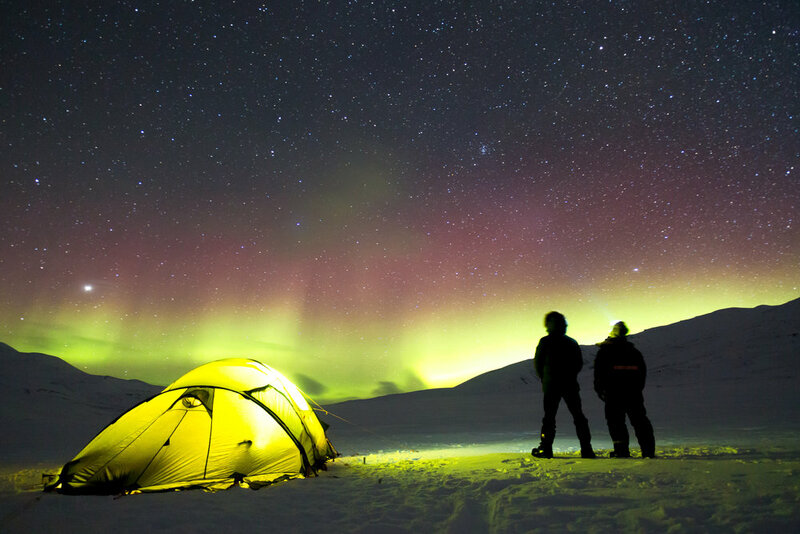 Stunning visuals of the true night sky in a professionally presented 360 degree theatre allow audiences to experience the universe with wonder and awe. Sit back and relax as you travel among the stars, learn about astronomy and space science, and get answers to your best space questions. A planetarium is a special space where the night sky is projected onto a domed surface above the heads of an audience. The dark environment simulates the experience of being outside on a clear night without any of the bright city lights that overpower the stars. A live presenter educates and entertains audiences, who can simply sit back and relax while the digital projection takes them exploring through the universe. Traditionally a planetarium is a specially designed building housed in a museum. Astronomy in Action’s portable planetarium travels everywhere in Ontario to bring amazing programs to your community. 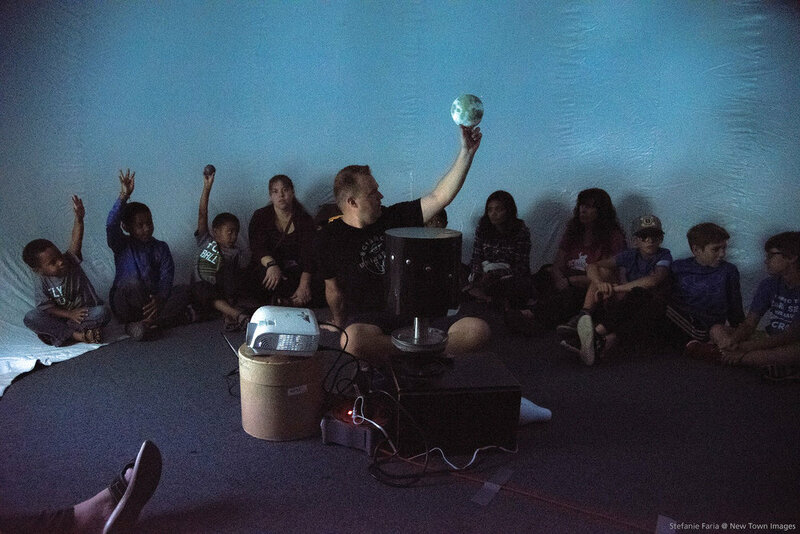 Astronomy in Action’s portable planetarium is the best way to take a field trip without paying for transportation, sending home permission forms, or spending your entire budget in one go. All our programs are based on the Ontario science curriculum, use a student centered learning approach, and are guaranteed to generate excitement about science and astronomy. For pricing, availability, and to book your planetarium program, contact us now! Astronomy in Action’s 30 minute program for elementary grades K-3 is an inquiry-based space mission for young students to experience the night sky in a fun and relaxing environment. Learn about Canadian astronauts aboard the International Space Station, travel through the solar system to visit the planets and their moons, and learn about constellations to see at night! All programs include answers to the great questions students can ask! Astronomy in Action’s middle school programs are the adventure of a lifetime! Students explore Mars and learn about the challenges of spaceflight before exploring the solar system and what lurks beyond Neptune. Once the stars come out, students will experience a truly dark night sky unlike anything they’ve seen before, learning how to navigate, find constellations, identify the Milky Way, and understand the properties of stars! All programs are STEM-focused and include answers to the great questions students can ask! Astronomy in Action’s programs for intermediate grades are made for students who are curious about space. Students will explore the properties of stars and how they form constellations, planets and the solar system, the Milky Way and Andromeda galaxies, black holes, and much more! By exploring the challenges of space flight from a Canadian perspective, students will understand what it means to be an astronaut and what it takes to travel to Mars and beyond. 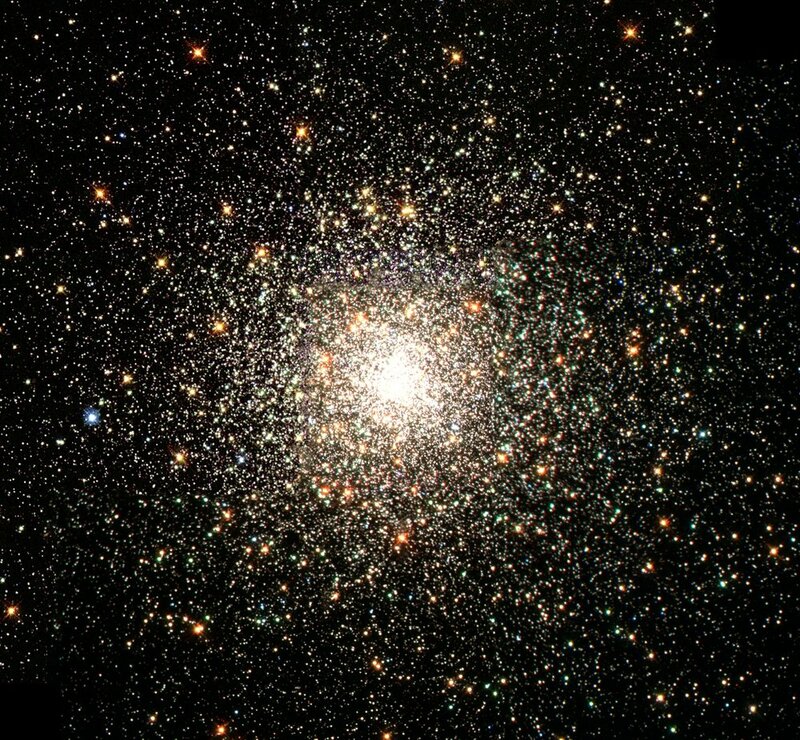 Questions are encouraged, and will be answered in the planetarium by an expert astronomer. Astronomy in Action’s senior programs are tailored to support science curriculum with stunning visuals and inquiry based STEM learning. Explore concepts such as star formation and properties, solar system formation and dwarf planets (Pluto too! ), galaxies, the Earth-Moon system, and cosmology concepts such as dark matter, black holes, and the Big Bang. With an expert astronomer, the deep questions that students ask are answered and discussed, providing valuable insight and encouraging students to learn more. Content is available for the Grade 12 Earth and Space Science course, and as always, student questions are encouraged! Raising funds for your school or parent council? Hosting a fun fair? Looking for ways to connect the school to the community? Astronomy in Action has a program made to raise funds for all the great work you do! A space journey for families that will generate excitement and lots of visitors. It’s also an enriching experience with a low cost, ensuring you keep more money to fund your future programs! Astronomy in Action’s programs for Scouts Canada and Girl Guides of Canada teach kids to navigate using the night sky, preparing them for their next outdoor adventure! Programs cover the astronomy badge requirements as well as the new Girls First program, and are tailored to each age group. We take care of everything, meaning leaders can sit back and enjoy the program! Looking to combine a program with a few different units? Want families to participate? We have space for everyone! A perfect program that campers will never forget! Boost your camp offerings with the fantastic portable planetarium. Setup indoors or outdoors (restrictions apply), and ensure all campers get great programming from an expert astronomer. Boost your camp’s profile without breaking your budget. Perfect for STEM / STEAM camps! Choose an entertaining program to send campers home smiling or some extra educational content to be popular with parents. 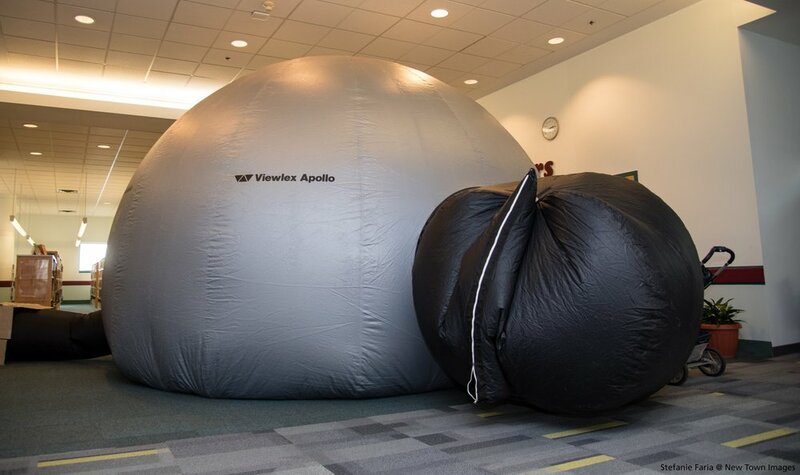 Bring in our inflatable planetarium and let us act as your personal 360 degree theatre. Custom content including logos and welcome messages can be displayed on the dome to personalize your event. Want to entertain staff and have a fun meeting? Want to impress clients and investors with a 360 display? Astronomy in Action makes your event out-of-this-world! Want more information? Have an idea that we can help you with? Please Get in touch! We look forward to hearing from you!